Turning 65 and aging into Medicare can be overwhelming for anyone. Doing so while treating for a serious health condition like cancer makes it doubly so. It’s natural for people new to Medicare to feel concern about coverage of cancer. Fortunately, Medicare treats cancer like any other illness. You’ll have both hospital and outpatient coverage, as well as drug coverage if you enroll in Part D.
Most cancer treatment will fall under Part B outpatient medical benefits. 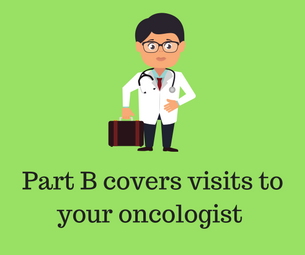 In addition to specialist visits and lab-work, Part B also provides important cancer coverage for surgeries, durable medical equipment, chemotherapy, and radiation. Medicare Part B covers 80% of the cost of these benefits after you first pay a small annual deductible. You are responsible for the other 20%. However, with a little planning, it’s easy to get the other 20% covered with supplemental coverage like Medigap and Medicare Advantage. We should also note that Medicare Part B provides great benefits for cancer prevention as well. Colonoscopies, mammograms, prostate screenings and well-woman exams are all covered at 100%. 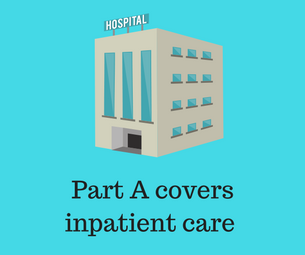 Should you have a hospital stay due to cancer, your inpatient benefits will fall under Part A. Medicare hospital coverage provides a semi-private room in the hospital, as well as benefits for skilled nursing, home health care, blood transfusions and hospice benefits. Medicare Part A covers the first 60 days in the hospital after you first pay a $1316 deductible (in 2017). This deductible usually goes up slightly every year. If you have a stay longer than 60 days, you start to incur daily hospital copays that increase with time and run out at Day 150. Once again though, you can easily cover these gaps with supplemental options. Treating for cancer often involves retail prescription drugs. These might be anti-nausea medications or pain medications. Since Medicare Part B only provides coverage for drugs administered in a hospital or clinical setting, most Medicare beneficiaries will want to enroll in a Part D drug plan. Think of Part D as a card that you use at the pharmacy so that you will not have to pay full price for a medication. Instead, you will only be responsible to pay your plan’s copay for that medication. Some oral chemotherapy drugs are filled by the patient at their local pharmacy. These would fall under Part D. Since these medications can often be very expensive, having a Part D drug plan will provide you peace of mind. All Medicare Part D plans provide catastrophic coverage. This means that if your drug spending goes over a certain limit each year, then the plan must kick in and pay 95% of the cost of your drugs for the rest of the year. Current that annual calendar-year limit is $4950 in 2017 and will go up to $5000 in 2018. Since this is important coverage for almost anyone, Medicare gives you a 7-month initial election period at age 65 to add a Part D drug plan. There are no health questions asked. You can also change your drug plan once per year during the annual election period each fall. 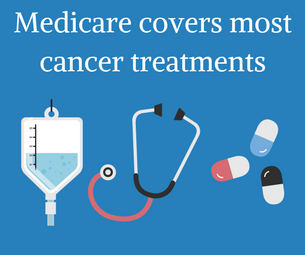 As you can see, Medicare provides essential and important benefits for the treatment of cancer and many other illnesses. However, most beneficiaries want additional coverage to pay for the deductibles and the 20% that Part B doesn’t cover. If Medicare is your primary coverage, there are two main options for you to get supplemental benefits. The first option is Medigap, also called Medicare Supplements. These plans have been around since the 60’s when Medicare was first signed into law. Medigap plans pay after Medicare. There are about 10 standardized Medigap plans to choose from. Each one covers different gaps in Medicare. Medicare Plan F and Plan G are two of the most comprehensive. Plan F pays for all the of the gaps, leaving you with nothing out of pocket, not even a doctor copay. Plan G does the same except that you will pay the annual Part B deductible. Premiums for Plan G are lower because of this. When you seek medical treatment, your provider will Medicare. Then Medicare pays its share and forwards the remainder to your Medigap plan so that the plan can pay its supplemental benefits. You can see any provider across the nation that participates in Medicare. It’s a huge network of doctors and hospitals and lab facilities. Another option for supplemental coverage is Medicare Advantage. These plans pay instead of Medicare and generally have networks. You agree to see the providers in the network for your care. Advantage plans often have lower premiums than Medigap plans and sometimes also include a built-in Part D drug plan. Members of Medicare Advantage plans pay copays for their care as they go along. It’s important to check the plan’s summary of benefits to see what your copays for various types of care will be. Not all doctors participate in Medicare Advantage plans though, so be sure to check that your doctors are in the network before you enroll. Treatment for cancer is tough, but Medicare and supplemental coverage can give beneficiaries great peace of mind. Knowing that you are covered and covered well can hope you to focus on healing and getting well instead of worrying about what bills will be arriving in your mailbox later on. Danielle Kunkle is a Medicare expert on the Forbes Finance Council and founder of Boomer Benefits, an award-winning insurance agency founded in 2005.